Here’s Sonam Kapoor walking the ramp during IIJW. Sonam Kapoor dons a quirky hairstyle during The Pure Concept event. Sonam Kapoor looks pretty as a picture in this simple yet lovely saree during the Filmfare event. Sonam Kapoor with hair let open and it seems a different color too. She looks kind of cute here. Sonam Kapoor during the L’Oreal Femina event. Sonam Kapoor walks the ramp in a side ponytail during the Colgate event. Clicked in a very elegant updo during the Cannes Film Festival. Clicked walking the ramp at the IIJW. This is one of my favourite looks. She came in this pretty dress on the sets of “Jhalak Dikhla Jhaa” with a stylish updo. She walks the ramp in a very pretty and elegant hairstyle. 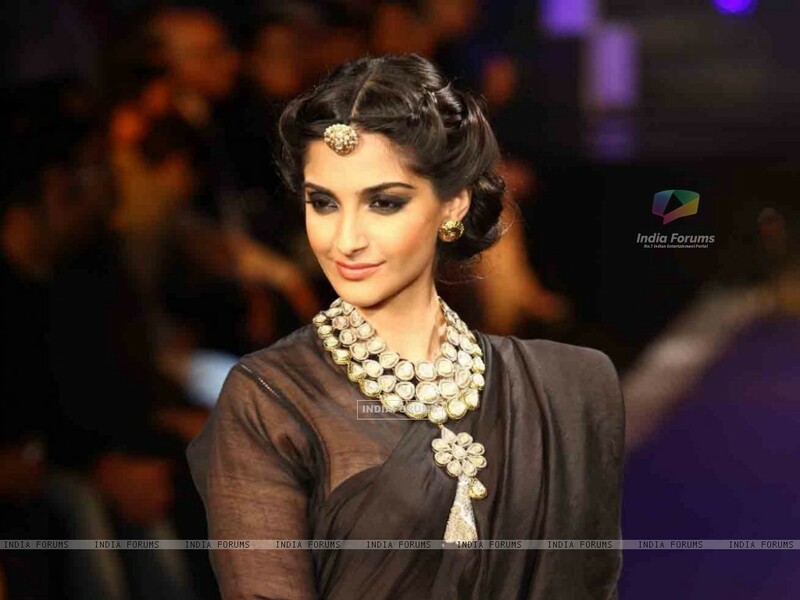 Another of my favourite ramp look of Sonam Kapoor’s, the saree, the hairstyle, the jewellery, everything is perfect here. She goes retro again for another event appearance. Image Sources: 1, 2, 3, 4, 5, 6, 7, 8, 9, 10, 11, 12, 13, 14, 15, 16, 17, 18, 19. It looks like MAC Ruby Woo to me…….but I can’t be sure. The lipstick is gorgeous though! Experimenting and that too confidently. She is Sonam Kapoor. I always feel (and yes even after Raanjhanaa,) that she belongs more to the ramp than to films. She has that poise and confidence to be a super model.